Chickpeas are the perfect & utterly delicious way to get protein into your diet! Rich in fibre, they are also great energy-boosters, making this recipe a healthy ‘on the go’ savoury snack. 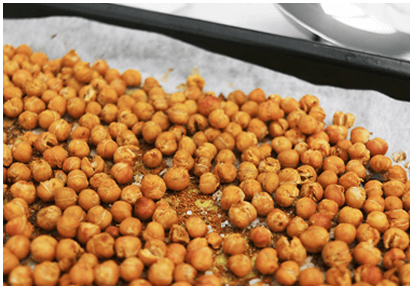 Super easy to make, these crunchy roasted chickpeas are made with only 4 ingredients! 1. Preheat the oven to 180 degrees and line a baking tray with greaseproof paper. 2. Drain and wash the chickpeas and place them into a bowl along with the lemon juice and curry powder. You can use any flavouring you like. Mix until well coated. 3. Spread the chickpeas on the lined baking tray and sprinkle with salt. 4. Place into the middle of the oven and allow to roast for 35-45 minutes. 5. Once roasted, carefully remove from the oven, enjoy whilst hot/warm or store in an airtight container for snacking. Serve this healthy dish with home made chutney, pickles or cooked winter vegetables.